​The regulator pressure could be set too low. ​What is the correct pressure setting for my DWX-4 or DWX-50? How do I perform that adjustment? A. Make sure the air compressor is operational. B. Check for any air leaks at all hose connections from the output of the compressor to the input of the regulator. C. The correct range pressure range for the DWX series is from 0.02 to 0.2 MPa. MPa stands for Megapascal, a derived unit of pressure. 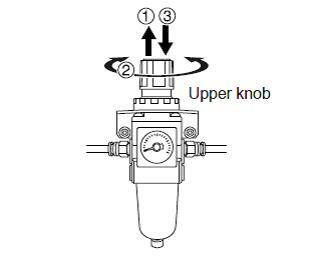 D. To adjust the pressure refer to the diagram below. 2. Slowly turn the knob to reach the proper range of 0.02 to 0.20 MPa. 3. Push down on the knob to lock the setting. Important- the maximum pressure setting is 0.20 MPa. Do not adjust beyond that pressure reading. Note: The pressure might drop during the milling process since the air is now flowing. Repeat steps 1-3 if that is the case. It is recommended to set the proper pressure for the type of material being milled.